On August 5th, 2011 in Washington D.C. the Embassy of Ukraine to the United States and the U.S. architectural company “Hartman-Cox Architects” signed the agreement on the establishment of the memorial in Washington D.C. to commemorate the victims of 1932-1933 man-made famine in Ukraine, known as Holodomor. 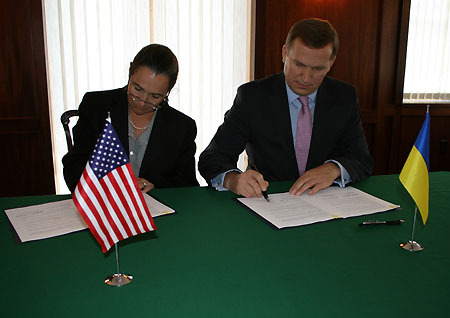 The agreement was signed by Ambassador Extraordinary and Plenipotentiary of Ukraine to the U.S. Olexander Motsyk and representative of “Hartman-Cox Architects” Mary Katherine Lanzillotta. The ceremony was attended by the co-chair of the Ukrainian-American Coordination Committee on Holodomor Memorial Michael Sawkiw, Jr. Conclusion of the agreement was made possible due to the recent decisions of the President and the Government of Ukraine to allocate budget funds for this project. The agreement envisages launching a review process with the appropriate federal agencies in accordance with the U.S. federal legislation to get their construction permit. As a part of the process, a final design of the memorial will be selected among the winners of 2009 competition, conducted by the Ministry of Culture and Tourism of Ukraine. The participants of the ceremony emphasized on the importance of this signing event, serving as a vivid example of fruitful cooperation between Ukraine and the Ukrainian American Community aimed at honoring the victims of one of the most tragic pages in the history of the Ukrainian people. For reference: in October 2006 the U.S. Congress adopted and the President G.W.Bush signed into law the U.S. Congress Act, which authorized the Government of Ukraine to establish a memorial on the Federal Land in the District of Columbia to honor the victims of Ukrainian Holodomor of 1932-1933.